This week’s Torah Portion contains a vast amount of information. A lot of things took place, the pillar of cloud and fire stood between Egypt and Israel (Shemot / Exodus 13:17-22), the Lord delivered the people from the Egyptian Army through the Red Sea (Shemot / Exodus 14:1-30), the people tested the Lord with the bitter water turned sweet at Marah (Shemot / Exodus 15:22-27), the Lord provided bread from heaven to test the people (Shemot / Exodus 16:1-36), the Lord providing water from the rock (Shemot / Exodus 17:1-7), and the Lord helps Israel defeat Amalek (Shemot / Exodus 17:8-16). For this week’s reading, the Talmud points out a very interesting aspect on the translation of the word לחם (lechem, bread) according to the Talmud Bavli Yoma 75b. The Rabbis of the Talmud point out this aspect of the bread (לחם) from heaven as being referred to as tasting like both oil (שמן) and honey (דבש). These two components parallel oil as providing light / righteousness (or as a metaphor for the Spirit of God) and honey as providing energy (or as a metaphor for internalizing wisdom). Rabbi Yosei interprets this as the bread is for the elderly (as in oil) and for children (as in honey) saying that each received what was appropriate. These things describe the Lord God providing for His people in the sense of meeting them in their current needs and to sustain their bodies in this world. The Talmud cites the following references from the Torah as proof texts. In Shemot / Exodus 16:4 we are told the Lord God provided bread from heaven and the command was to go out and gather each day for only one day worth of food, in order that the Lord may test them, whether or not they will walk in God’s instruction. In the same chapter (Shemot / Exodus 16) we are told the wafers tasted like honey, and later on in Bamidbar / Numbers 11 we are told the manna was gathered, and that there was a need to grind it, to beat it, and to boil it in order to make cakes. The taste was like that of cakes backed with oil. Based upon these Scriptures, there appears to be some effort that needed to go into the preparation of the manna in order for its suitability for consumption according to Bamidbar / Numbers 11:8. Studying the Torah, we also know that according to Vayikra / Leviticus 3:11, לחם (lechem, יא וְהִקְטִירוֹ הַכֹּהֵן הַמִּזְבֵּחָה לֶחֶם אִשֶּׁה לַיהוָֹה:) was used in the sense of “it is the food of the fire offering” where לחם is applied to the meat upon the altar. In the Tanach, studying the word bread (לחם, lechem) we learn this word come to be translated loosely as food, oil, honey, meat, and fruit (see Jeremiah 11:19, “Let us destroy the tree with its fruit (belachmo)”, יט וַאֲנִי כְּכֶבֶשֹ אַלּוּף יוּבַל לִטְבּוֹחַ וְלֹא-יָדַעְתִּי כִּי-עָלַי | חָשְׁבוּ מַחֲשָׁבוֹת נַשְׁחִיתָה עֵץ בְּלַחְמוֹ וְנִכְרְתֶנּוּ מֵאֶרֶץ חַיִּים וּשְׁמוֹ לֹא-יִזָּכֵר עוֹד:). The question is, “how does this lead to the theological concept of bread from heaven in the sense of Yeshua saying that He is this bread God sent from heaven?” (see John 6:41-51) In addition to this, notice how the people grumbled in the midst of the blessing God brought upon them in the provision of food in the wilderness. This grumbling may be compared to chaff being mixed with lechem. (Malbim on Shemot / Exodus 16:4 Part 1) The concept here is that ever since the sin of Adam, the bread of man (his works, the fruit of his labor) has been mixed with chaff (sin). It is at this point that HaShem was going to open up the heavens and pour out His mercy (pour down bread from heaven) that was free of chaff, just as the bread from before mankind and the world entered into sin, and similar to the Olam Haba (World to Come). These are all very rabbinic derived concepts here we are going to look at in this study! These concepts speak of the bread of this earth as being physical, and the bread from heaven as being spiritual. That which comes down from heaven is life sustaining, of both the physical and the spiritual. The rabbinic interpretations connects all of these concepts of the one sent from heaven being free from chaff (sin), of being life sustaining both physically and spiritually, of righteousness, of wisdom, of the Holy Spirit of God (the giving of), and of obeying God’s word which preserves life as it is stated previously in the Torah portion (Shemot / Exodus 15:25-26). 16:1 Then they set out from Elim, and all the congregation of the sons of Israel came to the wilderness of Sin, which is between Elim and Sinai, on the fifteenth day of the second month after their departure from the land of Egypt. 16:2 The whole congregation of the sons of Israel grumbled against Moses and Aaron in the wilderness. 16:3 The sons of Israel said to them, ‘Would that we had died by the Lord’s hand in the land of Egypt, when we sat by the pots of meat, when we ate bread to the full; for you have brought us out into this wilderness to kill this whole assembly with hunger.’ 16:4 Then the Lord said to Moses, ‘Behold, I will rain bread from heaven for you; and the people shall go out and gather a day’s portion every day, that I may test them, whether or not they will walk in My instruction. 16:5 ‘On the sixth day, when they prepare what they bring in, it will be twice as much as they gather daily.’ 16:6 So Moses and Aaron said to all the sons of Israel, ‘At evening you will know that the Lord has brought you out of the land of Egypt; 16:7 and in the morning you will see the glory of the Lord, for He hears your grumblings against the Lord; and what are we, that you grumble against us?’ 16:8 Moses said, ‘This will happen when the Lord gives you meat to eat in the evening, and bread to the full in the morning; for the Lord hears your grumblings which you grumble against Him. And what are we? Your grumblings are not against us but against the Lord.’ 16:9 Then Moses said to Aaron, ‘Say to all the congregation of the sons of Israel, ‘Come near before the Lord, for He has heard your grumblings.’‘ 16:10 It came about as Aaron spoke to the whole congregation of the sons of Israel, that they looked toward the wilderness, and behold, the glory of the Lord appeared in the cloud.b16:11 And the Lord spoke to Moses, saying, 16:12 ‘I have heard the grumblings of the sons of Israel; speak to them, saying, ‘At twilight you shall eat meat, and in the morning you shall be filled with bread; and you shall know that I am the Lord your God.’‘ 16:13 So it came about at evening that the quails came up and covered the camp, and in the morning there was a layer of dew around the camp. 16:14 When the layer of dew evaporated, behold, on the surface of the wilderness there was a fine flake-like thing, fine as the frost on the ground. 16:15 When the sons of Israel saw it, they said to one another, ‘What is it?’ For they did not know what it was. And Moses said to them, ‘It is the bread which the Lord has given you to eat. 16:16 ‘This is what the Lord has commanded, ‘Gather of it every man as much as he should eat; you shall take an omer apiece according to the number of persons each of you has in his tent.’‘ 16:17 The sons of Israel did so, and some gathered much and some little. 16:18 When they measured it with an omer, he who had gathered much had no excess, and he who had gathered little had no lack; every man gathered as much as he should eat. 16:19 Moses said to them, ‘Let no man leave any of it until morning.’ 16:20 But they did not listen to Moses, and some left part of it until morning, and it bred worms and became foul; and Moses was angry with them. 16:21 They gathered it morning by morning, every man as much as he should eat; but when the sun grew hot, it would melt. 16:22 Now on the sixth day they gathered twice as much bread, two omers for each one. When all the leaders of the congregation came and told Moses, 16:23 then he said to them, ‘This is what the Lord meant: Tomorrow is a sabbath observance, a holy sabbath to the Lord. Bake what you will bake and boil what you will boil, and all that is left over put aside to be kept until morning.’ 16:24 So they put it aside until morning, as Moses had ordered, and it did not become foul nor was there any worm in it. 16:25 Moses said, ‘Eat it today, for today is a sabbath to the Lord; today you will not find it in the field. The rabbis describe this bread from heaven (manna, מן השמים) as being more spiritual than physical. (see Malbim on Shemot / Exodus 16:4 Part 1) We are also told according to Bamidbar / Numbers 11 that a great deal of labor was required for the preparation of the לחם (lechem) as food to eat. This alludes to the amount of effort we are to strive in studying God’s Word, and conforming our lives to righteousness. The Author of the book of Hebrews describes this in the following way saying, 12:2 fixing our eyes on Jesus, the author and perfecter of faith, who for the joy set before Him endured the cross, despising the shame, and has sat down at the right hand of the throne of God. 12:3 For consider Him who has endured such hostility by sinners against Himself, so that you will not grow weary and lose heart. 12:4 You have not yet resisted to the point of shedding blood in your striving against sin; 12:5 and you have forgotten the exhortation which is addressed to you as sons, ‘My son, do not regard lightly the discipline of the Lord, Nor faint when you are reproved by Him; (NASB) There is a certain amount of emphasis the author of the book of Hebrews is making in regards to sin that is connected to keeping our eyes upon God’s Messiah and relating his suffering to our suffering in this world. Rashi, Sforno, and Chizkuni state the following concerning Shemot / Exodus 16:4. למען אנסנו הילך בתורתי THAT I MAY TRY THEM WHETHER THEY WILL WALK IN MY LAW — whether they will observe the commands associated with it: viz., that they should not leave any overnight, and that they should not go out on the Sabbath to collect it. לחם מן השמים, “bread originating in the celestial regions.” The word שמים, both here and in numerous other instances describes any region in the universe inaccessible to human beings. The expression שמים, “heaven,” is used to remind the people daily that their needs will be met from heaven. The idea here is of the Lord God testing the people to see where they put their trust and allegiance. The command to go out and collect only one days worth of food is paralleled to receiving food without effort. Having been given food, the people did not need to labor to plow, plant, harvest, and prepare the לחם (lechem, bread). The purpose was they had no excuse to not take care to keep the command of God. The Lord provided a miracle during the Shabbat, the Manna would last two days, as opposed to every other day it would rot and stink on the second day. This gave them time to study God’s Word (i.e. Torah study) since they would have had little distraction from devoting time to studying and drawing near to the Lord. Chizkuni states this bread originated in the celestial regions where the word Shamayim (שמים, heavens) is a reference to regions in the universe inaccessible to human beings. All of these things draw in a particular context of Who Yeshua is as the living Word of God (John 1) when Yeshua said “I am the bread from heaven” (see John 6:22-59) he was drawing in all of these rabbinic concepts. The Talmud Bavli Taanit 9a states the following concerning the bread from heaven. After this brief digression, the Gemara turns to the fifth in the series of statements by Rabbi Yoḥanan concerning rain. Rabbi Yoḥanan said: Rain falls even for the sake of an individual, in response to the petition of a single person in need of rain, whereas a blessing of sustenance comes only for the sake of many. Rain falls even for the sake of an individual, as it is written: “The Lord will open for you His good treasure, the heavens, to give the rain of your land” (Deuteronomy 28:12). The fact that this verse is written in the second person singular demonstrates that rain can fall even for the sake of an individual. Rabbi Yoḥanan further proves that sustenance comes for the sake of many, as it is written: “Behold I will cause to rain bread from the heavens for you” (Exodus 16:4). Here, God is referring to the people in the plural form. Notice how a comparison is made between the rain that falls and the bread from heaven. Rain falls for the prayer of an individual, bread for the prayer of the entire community. When rain falls, it provides water for the land to produce its crops, which a man may use to produce bread. This teaches us of the servant attitude, taking what God has blessed us with and laboring to bless others with sustenance. What the Rabbis are describing here about the bread is that the bread was given to the people (plural) which could be how Yeshua referred to himself as being for the people. We look to Yeshua for the servant attitude on the individual level, and for sustenance and spiritual food on the spiritual level. 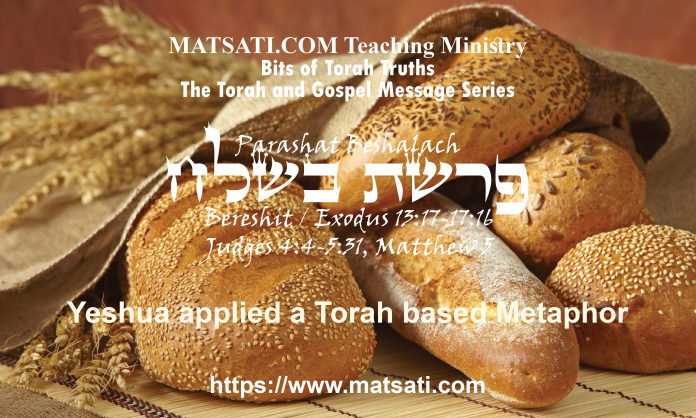 The testing of faith in the sense of the illustration given here in the Torah command of God on the instruction to gather only one days worth of food is to trust in the Messiah, the One whom God had sent to save us from our sins. The Rabbis say “Anyone following My instructions not to save any of it for the following day will be considered by Me as having displayed his faith in Me. A person who has enough to eat for one day, and is worried about the morrow, is considered by Me as having displayed lack of faith in Me.” (Chizkuni on Shemot / Exodus 16:4 Part 2) This matter of faith connects us to Yeshua’s claim of being the bread that comes down from heaven, he was illustrating what he was doing, teaching His people, leading his people in God’s Ways, laying down his life for his people, and being raised from the grave by the power of God (a miracle). What we are learning from these things is He who created the universe also created the means for His people to remain alive and well, emphasizing both the spiritual and the physical aspects that are drawn out in the manna (lechem) that descended from heaven. It is interesting to note on Shemot / Exodus 16:4, ד וַיֹּאמֶר יְהוָֹה אֶל-מֹשֶׁה הִנְנִי מַמְטִיר לָכֶם לֶחֶם מִן-הַשָּׁמָיִם וְיָצָא הָעָם וְלָקְטוּ דְּבַר-יוֹם בְּיוֹמוֹ לְמַעַן אֲנַסֶּנּוּ הֲיֵלֵךְ בְּתוֹרָתִי אִם-לֹא: 16:4 Then the Lord said to Moses, ‘Behold, I will rain bread from heaven for you; and the people shall go out and gather a day’s portion every day, that I may test them, whether or not they will walk in My instruction. (NASB) In the Masoretic Text, the text reads, וַיֹּאמֶר יְהוָֹה אֶל-מֹשֶׁה “the Lord God said to Moshe” הִנְנִי מַמְטִיר לָכֶם לֶחֶם מִן-הַשָּׁמָיִם “behold I am about to cause bread to rain down for you from heaven.” Here the Lord did not say לאמור “to tell” the people about what God is about to do. The Lord begins by addressing Moshe directly and refers to the people in the third person לְמַעַן אֲנַסֶּנּוּ הֲיֵלֵךְ בְּתוֹרָתִי אִם-לֹא to “find out if the people will walk in my instruction or not.” The rabbis describe the Manna as falling just outside the door of the tent for the righteous (hinging upon the word “rain down”) as opposed to the unrighteous who needed to travel outside the camp to collect their food. This may be the reason the Lord did not tell Moshe to speak to the people here because he was later going to repeat these things to the people a little bit later. Notice also how the glory of God appeared immediately after Moshe told the people what was about to happen. (Shemot / Exodus 16:6 So Moses and Aaron said to all the sons of Israel, ‘At evening you will know that the Lord has brought you out of the land of Egypt; 16:7 and in the morning you will see the glory of the Lord, for He hears your grumblings against the Lord; and what are we, that you grumble against us?’ NASB) In addition to this, note how the Hebrew text writes on Shemot / Exodus 16:4 saying, וְיָצָא הָעָם וְלָקְטוּ דְּבַר-יוֹם בְּיוֹמוֹ with the expression לְקִיטָה “gleanings” as a description for the manner in which the bread was to be collected. This observation isn’t just in the sense of the nature of the manna as harvesting “grain-like” food (Rabbeinu Bahya, Shemot / Exodus 16:4 Parts 1-7) but also that there is a deeper spiritual meaning to the manna which comes down from heaven. לחם, “bread.” It is described as “bread” seeing that this is what the people tried to make it substitute for. Every kind of פת is called לחם, not only baked goods made from wheat or barley. We also encounter the term עוגות as describing bread, as in Genesis 18,6, and Numbers The term ממטיר is justified, as the Torah describes ingredients which rained down which would subsequently be converted into bread. Our benediction over bread is המוציא לחם מן הארץ, which also does not mean that G’d produces ready-made bread as emerging from the earth, but we thank Him for having the earth produce ingredients fit to convert into bread, i. e .the staff of life. Some commentators claim that the word לחם does not refer specifically to bread, but to food in general, and G’d was saying to Moses that the people’s food would rain down from the heaven. The meat G’d was going to provide was also included in the line הנני ממטיר לכם לחם מן השמים. We encounter the expression לחם אשה, “food being burned up on the altar,” many times, and it never refers to bread, but to sacrificial meat. (compare Leviticus 3,11; 3,16; Numbers 28,2) Both the selav and the manna materialized for the people as if dropped literally from “heaven.” For some reason, G’d enlarged on the gift of the manna, which was a necessity, whereas He did not elaborate on the selav, which was a luxury. This commentary draws out the use of the Hebrew word לחם being of heavenly origin and to the food being burned on the altar. Here the bread Lechem (לחם) is connected to the supernatural being of heavenly origin, the sacrifices, and the meat upon the altar. It is interesting how at this point, the way all of these things are connected, we can see how God wanted to familiarize His people with the concepts of sacrifice, blood atonement, righteousness, faith, faithfulness, heavenly blessing, etc because their lives would depend on these things. These things provide for us an object lesson to prepare us to understand the importance of being led by God’s Messiah, holding to the Truth of His Word, having faith in our Father in heaven, coupled to atoning work of Yeshua, and the spiritual food we receive from God’s Word. What we find here is the Story of our salvation unfolding in the language of the Torah. Based upon all of these things, it is very apparent how and why Yeshua was using this illustration of Manna from the Torah to describe Himself as being the bread that comes down from heaven. The rabbinic interpretations connects all of these concepts of the one sent from heaven being free from chaff (sin), of being life sustaining both physically and spiritually, of righteousness, of wisdom, of the Holy Spirit of God (the giving of), and of obeying God’s word which preserves life as it is stated previously in the Torah portion (Shemot / Exodus 15:25-26). The Talmud Bavli Yuma 76 describes the Manna as teaching us to be dependent upon the mercy of God every day of the year. This is why the Lord chose to provide the Manna new each day as opposed to supplying a year’s supply of food at one time. It is at this point that HaShem was opening up the heavens and pouring out His mercy (pouring down bread from heaven) that was free of chaff (Yeshua being free from sin), just as the bread was provided from heaven from before mankind and the world entered into sin (rabbinic analogy), and paralleled to the heavenly food in the Olam Haba (World to Come). The concepts of Yeshua being without sin, the perfect sacrifice, the one who lays his life down on our behalf, the one through whom we are fed both spiritually and physically, all of these concepts are very rabbinic in nature, and taught to us according to the Torah! The Story of the deliverance of Israel from Parashat Shemot to Parashat Beshalach are foundational for understanding the gospel. We see in the descriptions of the Passover lamb as needing to be unblemished and flawless, this is paralleled to the bread from heaven that was without chaff, this is necessary since we need a sinless substitute to take our place in judgment. We take shelter today under the blood that was poured out from the Messiah! The rabbis say Shemot / Exodus 16:4 speaks of the bread of this earth as being physical, and the bread from heaven as being spiritual. Yeshua’s use of these concepts saying He is that bread which comes down from heaven, connects His physical life to the spiritual by His sacrificial death as the avenue of escape that God has provided to spare us from condemnation and eternal death. The message of the gospel is that one need not be Jewish to take part in this blessing. All one must do is believe in the One whom God has sent to save us from our sins and then walk in His ways! This is how the Torah and the gospel message go hand-in-hand together!